Is the “Police Lives Matter” march in Texas taking a shot at black activists? The rhetoric is starting to get heated as marchers in Texas march for a slain deputy under the "Police Lives Matter" banner -- a clear response to the "Black Lives Matter" movement. Thousands of people gathered in Houston to honor a Texas deputy shot and killed last month, and they’re doing it in a way that could stir up some emotions: they’re calling it “Police Lives Matter,” a clear response to the “Black Lives Matter” movement. A total of 19,000 people lined the streets in Houston to promote “Police Lives Matter” after the slaying Darren Goforth, a deputy in Harris County, according to a KSN.com report. Goforth was shot to death execution style while at a gas station. Police showed up to support the march, bringing a motorcade to accompany people who walked four and a half miles in northwest Houston. The event also featured guest speakers and a moment of silence before the march got under way. Goforth was shot and killed in Cypress, Texas, on Aug. 28 at about 8:30 in the evening. He was pumping gas at the time when 30-year-old Shannon Miles allegedly killed him execution style. Miles was arrested on capital murder charges the next day. The shooting was reminiscent of the shooting of two New York Police Department officers last year as they sat in their car. The shooting was apparently done in response to the high-profile killings of Brown, Garner, and others. 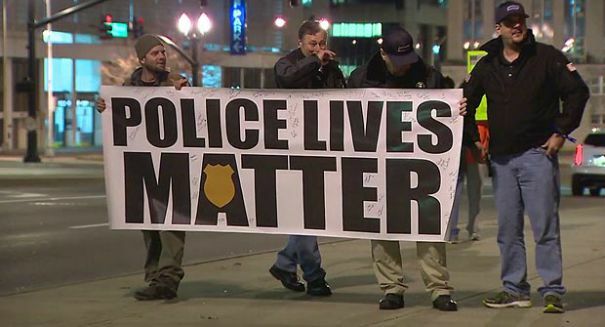 This most recent slaying is what prompted marchers to demonstrate for “Police Lives Matter,” feeling that police are under threat due to the negative publicity they have received in recent months.